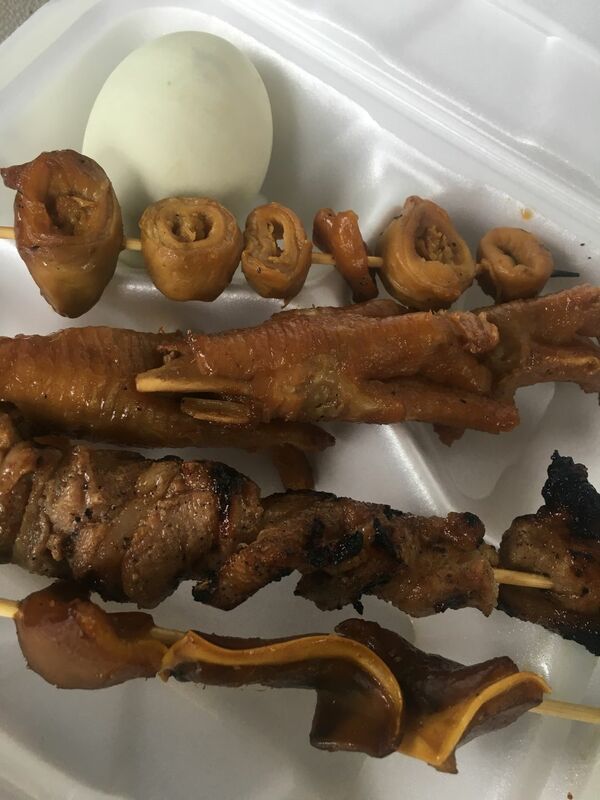 The sampler plate: balut, pork isaw, chicken feet and pork ear. There is more to the Philippines than lumpia, pancit and Manny Pacquiao. 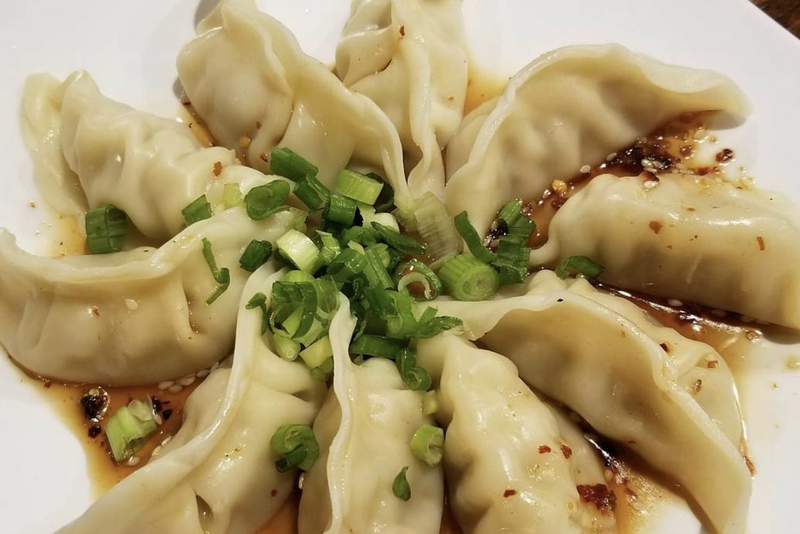 And though the Southeast Asian country may still be unfamiliar to many Houstonians, the popularity of Filipino cuisine in our ever-diversifying city is increasing steadily as more foodies become acquainted with Pinoy-style pork belly and baked goods. 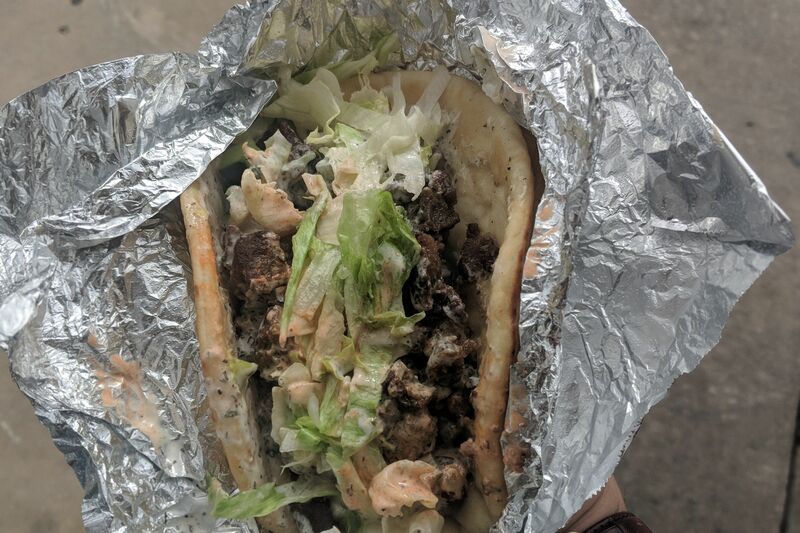 To wit: Houstonia's recent list of the best Filipino restaurants in the city, which would have been a far smaller sampling in prior years. 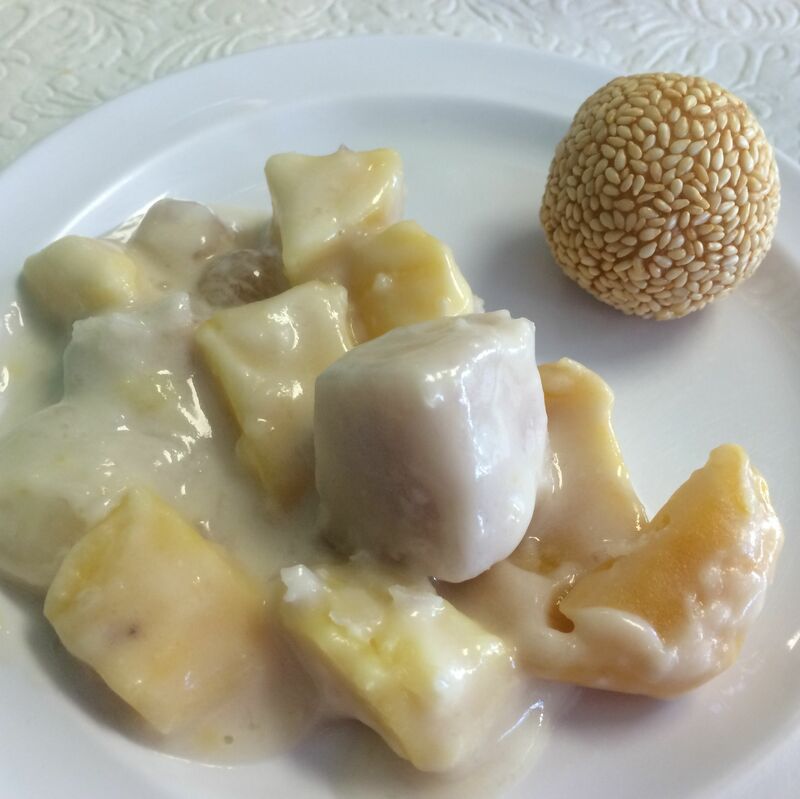 While ordering the fish balls, I imagined my dad joking, “Wow! Those must have come from one BIG fish!” But alas, these balls have nothing to do with fish private parts. And sadly, these fish and lobster balls had the same artificial flavor of the imitation crab from a California roll. Oh joy! Grilled chicken talons! I used to eat chicken feet as punishment when I was a child, but this time I tried them for you. Eating chicken feet is not a dainty task. I gnawed on the foot, making sure to avoid the claws and spit out the bones. In the end I was left with a bit of tasty skin and cartilage, but I would rather not work so hard to get so little. 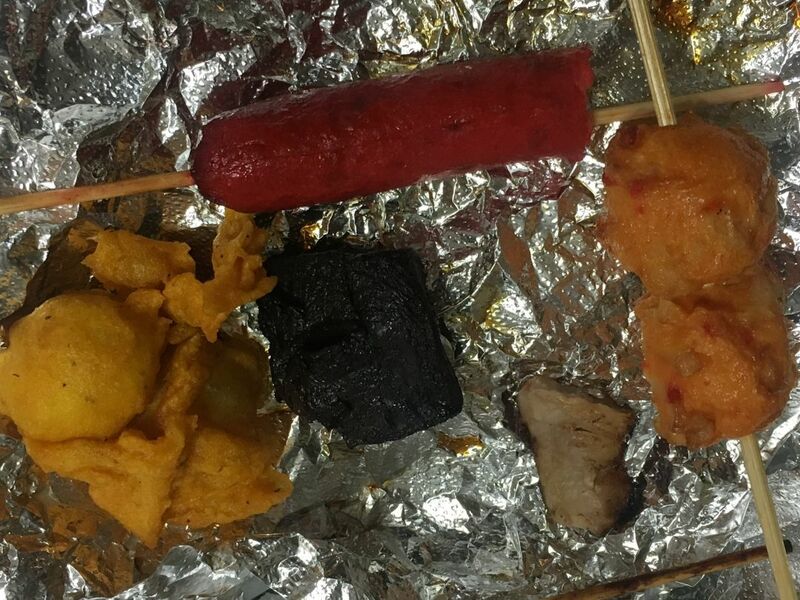 A little bit of everything: kwek-kwek, hotdog, betamax and lobster balls. Filipinos have an affinity for hot dogs. Whether chopped up in spaghetti, eaten with garlic fried rice, or skewered between marshmallows (yes, this is a thing), the bright red Filipino hot dog can do no wrong. Luckily there were no marshmallows on my hot dog, but it tasted just as you’d suspect…like a hot dog. Referred to as such for its box shape, which is similar to the old school Betamax videocassette tapes (for the younguns, this is what people watched before iPads, DVDs and Amazon Fire Sticks), grilled Betamax is an item that might make you a little…squeamish. Coagulated pig’s blood isn’t the first thing that comes to mind when I hear the word “barbecue”, but this is a prime example of the highly resourceful nature of Filipinos. Initially the iron taste was off-putting, but once the marinade hit my palate I found myself reaching for more blood cubes. Filipinos are known for employing repetitive nicknames: LuLu, TinTin, JunJun, BingBing, you catch my drift-drift. Following this strange Filipino tradition is the breaded quail egg, or Kwek-Kwek (like quack quack). Hard-boiled quail eggs deep-fried in orange batter are a common street food in the Philippines. 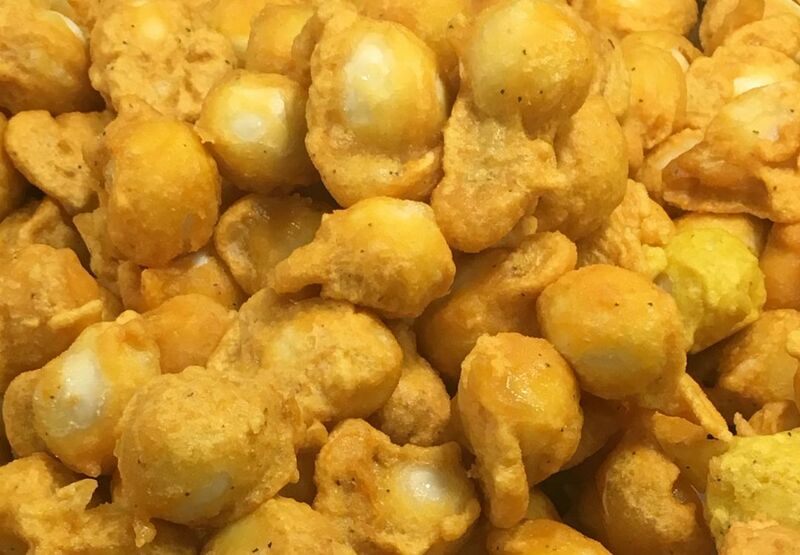 In true Texas fashion, it is understood that anything deep fried is good, including these adorable fun-sized eggs. Another excellent example of Filipino ingenuity comes in the form of a rather smelly organ. After a thorough cleaning, a pig’s intestines can be cooked in a number of ways to be paired with a plethora of sauces. The grilled variety was daunting at first, but after a little consoling (and a little prayer) I dove in head first. Pork isaw has a wonderful crunchy exterior followed by a soft chewy inside. Every now and again the unmistakable taste of intestinal debris would come through, but that’s nothing a little sawsawan (the catch-all name for any of the numerous Filipino dips) can’t fix. Give a Filipino a body part, and they will show you how it can be marinated beyond recognition. Barbecued pork ears are first reverse-braised, a method commonly found in Spanish cuisine, then grilled over an open flame. The tender cartilage is soft enough to chew, but still has enough snap to make you ask, “What the hell am I eating?”—in a good way of course. If you haven’t guessed yet, Filipinos love their pork parts. Crispy pata, another ode to pork, is a whole pig leg (ankle and all) simmered in spices until fork-tender, then deep-fried until the meat is succulent and the skin is golden brown. 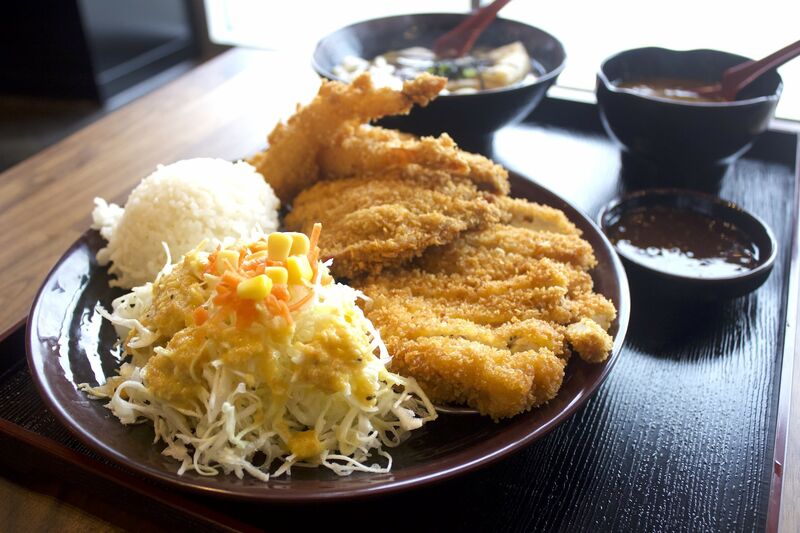 Don’t pretend you didn’t just drool. Pulling off chunks of meat and crisp fried pig skin with your bare hands will make you wonder why you ever used silverware to begin with. 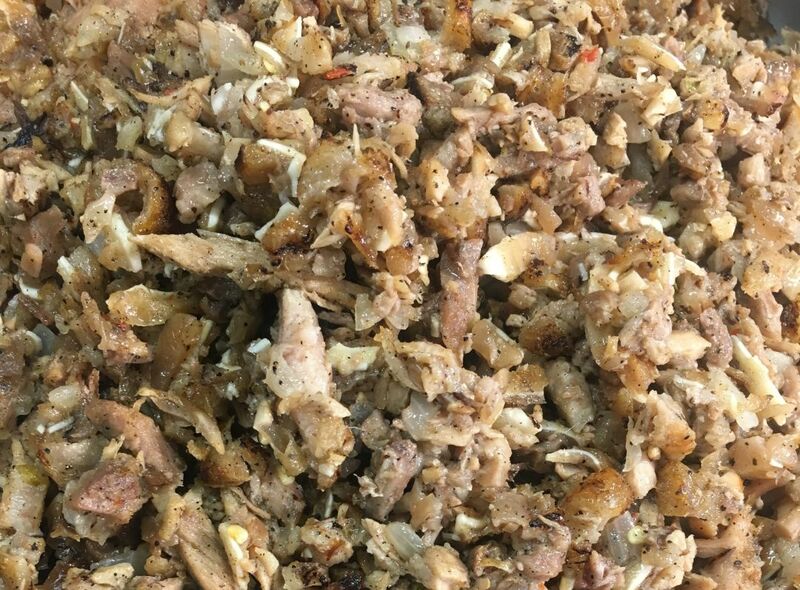 Tamest of all Filipino street foods is the Pork BBQ. This dish makes an appearance at every Filipino gathering. From house christenings to Pacquiao fights, each host has their own secret recipe (some swear by the addition of 7UP, and others rely on the proper ratio of soy sauce to vinegar). 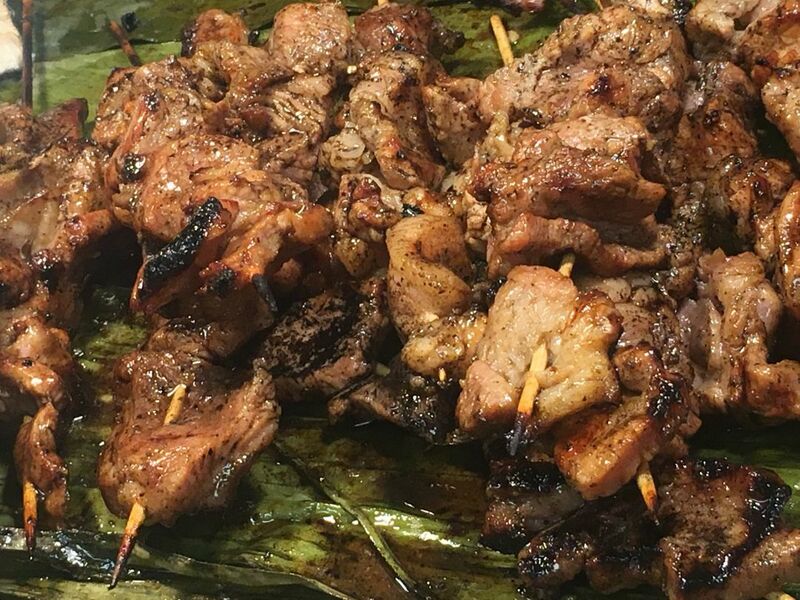 Filipino Cuisine does Pork BBQ right by using a near perfect marinade and charring the pork’s fatty crevices. 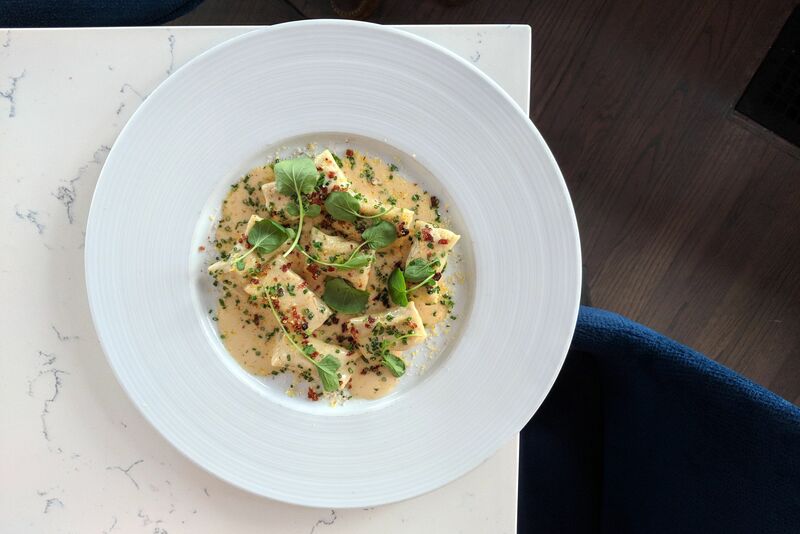 And finally—a dish that isn’t made of offal or miscellaneous meat. After discovering chicken chicharron, all other fried skins just seem inferior. Paired with the right sawsawan, you will find it nearly impossible to stop snacking, with your only limitation being an empty plate. 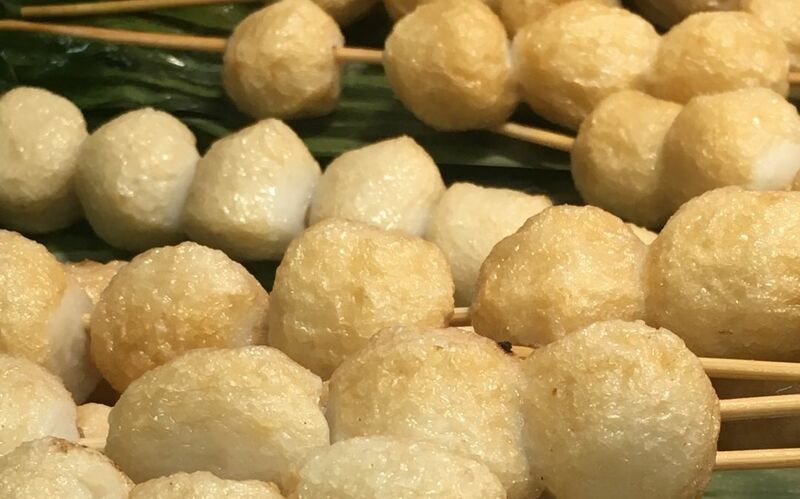 This addicting treat is best paired with a beer, and if you really want to taste the Philippines then make it a San Miguel. Balut: the holy grail of Filipino street foods. When people think of balut, their first reaction is to run the other way or gag dramatically. I, on the other hand, grew up loving the infamous fertilized duck egg. Balut’s combination of soup, fresh baby duck, and massive yolk is enigmatic in its delicious blend of flavors and textures. 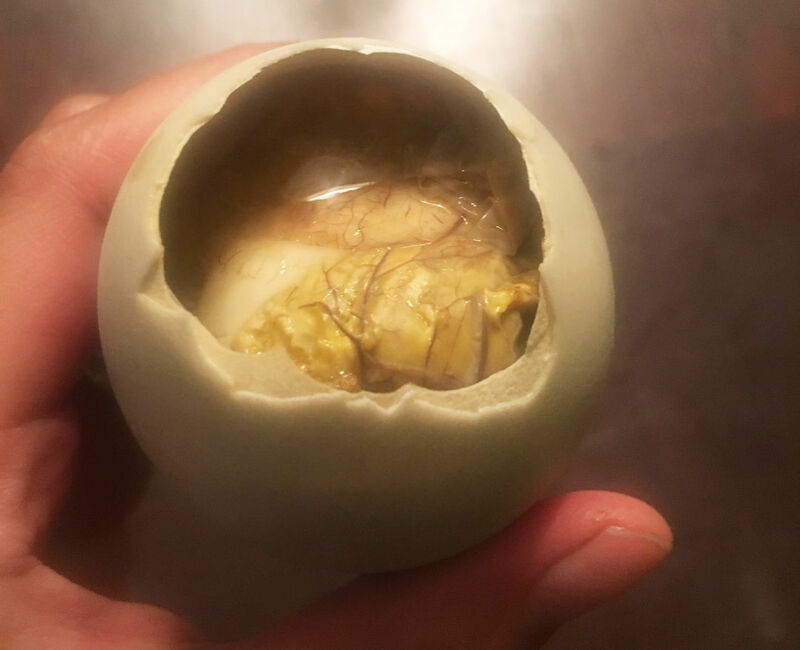 Cracking a hole into the wide end of the egg will reveal a thin membrane; underneath hides a savory chicken broth (actually, it’s amniotic fluid) that you can season and sip. You now have access to the giant yolk and baby duckling. Eating the whole thing can be overwhelming for some given balut’s carnal texture. If anything, nominate a brave friend to remove the duckling, and prepare to relish the most decadent egg yolk you’ve ever tasted. Don’t allow balut’s bad rep to stifle your culinary audacity. Balut is good. Balut is your friend. Balut consumption will turn you into an honorary Filipino. And that is why balut made it to the number one spot on my list. 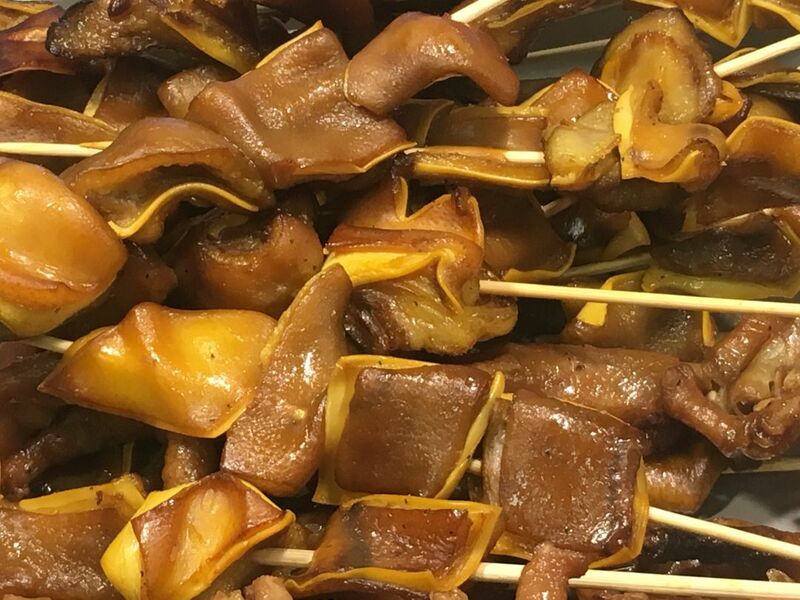 Eating this will make you an honorary Filipino; open wide. $ Filipino 10950 Bissonnet St.